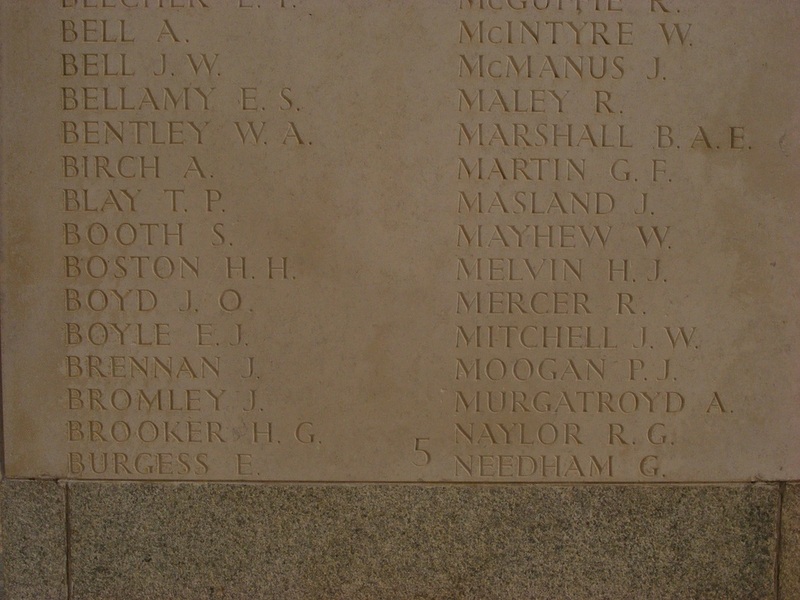 Lieutenant John Murray Kerr was born on the 25th April 1918, the son of John Murray (senior) and Louisa Rigotti Kerr. He was educated at Lincoln, before taking employment as a Land Agent and Assessor in South Wales. John enlisted into the Welch Regiment and served with them during the early years of WW2, before travelling to India and being posted to the 13th King's. He arrived at the Atta Camp in Patharia on the 6th November 1942 and was placed into Chindit Column 5, under the command of Major Bernard Fergusson. Lieutenant Kerr was given command of one of the column Rifle Platoons (Platoon 8), replacing Lieutenant George Borrow, formerly of the Sussex Regiment, who had recently taken up a new role with Column 8. John was stoutly built with a forceful manner. He was very outspoken and possessed strongly held opinions, on which nothing could induce a compromise. He had brought with him new ideas of man-management and new fighting techniques in 'unarmed combat', which seemed to consist of low-life gangster fighting and was exceedingly keen to teach it to the men. I called it barbaric and forbade it. However new and unconventional these tactics were, to shall we say, more traditional soldiers of the British Army, they would prove to be effective against an enemy that was quite willing to fight in a similar, if not more unorthodox manner. In October 2011, I was incredibly fortunate to be contacted by Miranda Skinner, the niece of John Murray Kerr. From the information and documents Miranda has shared with me, I am able to present a first-hand and more personal account of how her uncle became separated from his unit in Burma and ultimately, a prisoner in Japanese hands. 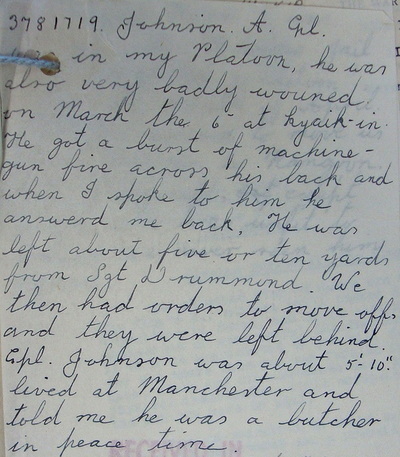 In this first instalment, I am going to use John's diary, written retrospectively when a prisoner of war inside Rangoon Jail, to explain the circumstances of the engagement at Kyaik-in and his eventual capture. Column 5 were given one specific task by Orde Wingate in 1943, this was to destroy the railway bridge at the Bonchaung Gorge. It was on their journey to Bonchaung in early March 1943, that John Kerr and his platoon were caught up in a brief, but extremely fierce fire-fight with a Japanese patrol. On the morning of the 6th of March, everybody got off to time; but before I had marched four hundred yards along the road, Fitzpatrick, Tommy Roberts's groom, came up at a gallop, somewhat flustered. He had been up and down the road for fifteen minutes, unable to spot the point in the jungle where our bivouac had been. (I never bivouacked within five hundred yards of a track). 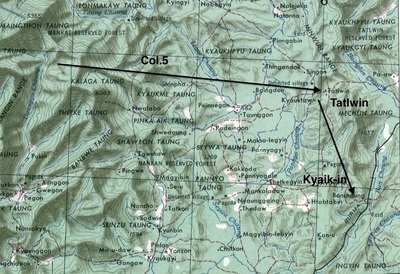 Tommy was engaged in Kyaik-in village with some Japanese; he had sent Jim Harman back and round to go straight for the gorge, and was fighting it out himself. I asked Fitzpatrick (in civil life a buttons in a Liverpool hotel) for details, but all he knew was that there was a lot of shooting going on, and a lot of bangs, and Tommy had sent him back to warn me. I hastily decided to send the main body straight off across country to Bonchaung. I sent the remaining rifle platoon, now commanded by Gerry Roberts, down the motor-road to the village as fast as it could go, to back up Tommy, while I gave Alec and Duncan their orders. When I had finished, I took Peter Dorans, and followed Gerry. As I drew near the village, I could hear light machine-guns in action, and the occasional burst of a grenade. The jungle was continuous on the right of the road, but there was a small strip of disused paddy, with some scrubby bushes, on the left; and by the time I arrived (for it took a minute or two to give out the orders to the main body) Gerry's leading Bren section was already in position, and had fired on a small party of Japs. Obsessed with the importance of avoiding a fight with our own troops, I begged him to be careful, and to work gradually along the track. I saw two men of the original party in the bushes on the right, one of whom was Bill Edge's servant, who had been with Tommy: he told me that Bill Edge had been hit, had gone off with Bill Aird to get his wound dressed, and told him to stay by his pack. By this time all was quiet, except for one light machine-gun firing at us from the south-eastern end of the paddy; but its fire soon ceased, and somebody found the gunner dead by his gun half an hour later. I pushed gingerly forward with a section, and found a fork in the road; one branch, which seemed to be the main road, ran over the hill, and the other went into the village. In the point of the wood at the fork, I saw Private Fairhurst, who called to me that John Kerr was there, wounded. I crossed the road, noticing as I did so two dead Japs, and found John with a painful wound in the calf of the leg, right in the muscle. Beside him were half a dozen Japanese dead and two or three other British dead or wounded: among them was poor Lancaster, the boy who had been one of my swimming instructors, unconscious and almost out. I offered John some morphia, but he refused it until he had told me his story, in case his brain got muddled, very typical of his devotion to duty. They had walked head-on into a lorry-load of Japs standing in the village: he thought they had just climbed into it after cross-examining the villagers. They had killed several of them at once, but the driver had driven off immediately, with at least two bodies in the back, to the south. They thought they had killed everybody, for the loss of two killed and Bill Edge and one or two others wounded; and Tommy Roberts had gone on. John was waiting only to collect his platoon, when suddenly a new light machine-gun had opened up, and hit him and several more. While he was telling me this, there was a sudden report just beside my ear, and I spun round to find Peter Doran with a smoking rifle, and one of the two "dead" Japs in the road writhing. He had suddenly flung himself up on his elbow and pointed his rifle at me. Peter shot him again and finally dispatched him. 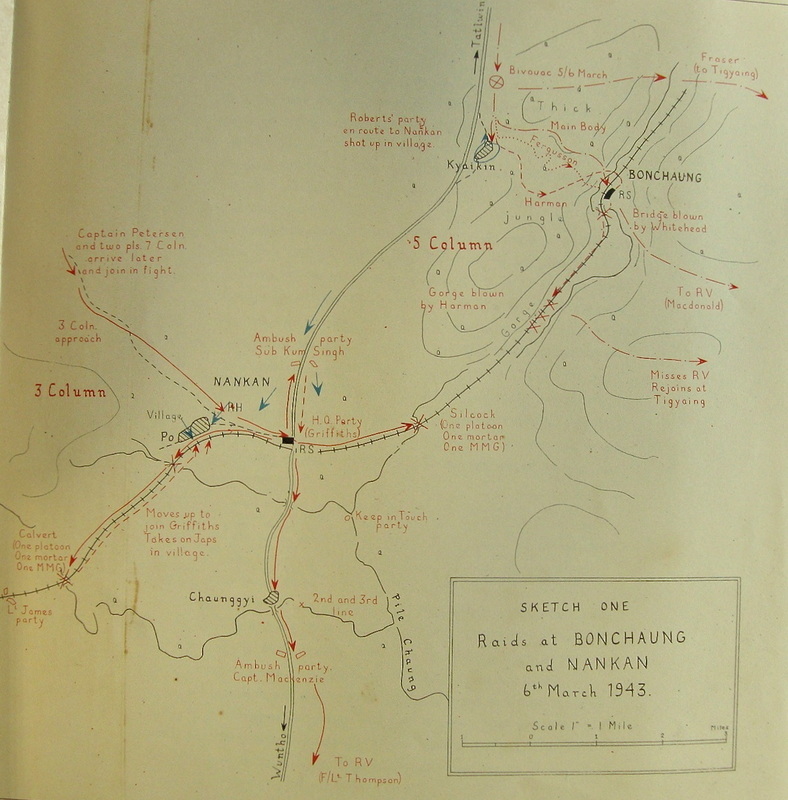 Seen below are some images in relation to this story, including some maps of the area around Bonchaung and Kyaik-in. Please click on any image to bring it forward on the page. What to do with the wounded ? The problem we had all so long dreaded had at last arisen. There were five of them unfit to move, and by bad luck they included not only John but his platoon serjeant and two of his section commanders: they had all been together at the fatal moment. The truck had got away, and there was no knowing when the Japs would come back on us. We hoisted three of them on to mules, and bore them down to the village a hundred yards away; and there we left them with their packs, and earthen jugs of water, in the shade under one of the houses. One of them said, "Thank God, no more walking for a bit"; one, Corporal Dale, said, "See and make a good job of that bridge;" and John Kerr said, "Don't you worry about us, sir, we'll be all right." The other two were too sick to move, and we had to be content with telling John Kerr where we had left them. Sixteen dead Japanese were counted in and around the village. It was thought that the one who got away in the lorry was the only survivor. One Gurkha Naik, by the name of Jhuriman Rai, one of six whom I had sent with Tommy as a change from muleteering, killed no less than five of them, three with his rifle and two with his kukri. Five bullet-holes were found in his clothing and equipment afterwards. With Gerry Roberts's platoon, and with the much saddened platoon of John Kerr, I sought the track to Bonchaung, but could find no trace of it. To the south we heard various explosions; we knew it could not be Jim Harman already, and rightly guessed it was Mike Calvert celebrating his thirtieth birthday on the railway. I became more and more anxious to hurry to Bonchaung, and so I told Gerry to come on with men and animals as fast as he could, while I pushed on ahead with Peter Dorans. We got there just after five o'clock, to find everybody in position. David Whitehead, Corporal Pike, and various other sappers were sitting on the bridge with their legs swinging, working away like civvies. I found Duncan Menzies, who told me that Jim Harman had had a bad time in the jungle, and had turned up at Bonchaung half an hour before, having got hopelessly bushed: he had now set off down the railway line towards the gorge. David hoped to have the bridge ready for blowing at half-past eight or nine; he had already laid a "hasty" demolition, which we could blow if interrupted. Until he was ready there was nothing whatever to be done, bar have a cup of tea. I had several. Duncan had everybody ready to move at nine, mules loaded and all. David gave us five minutes warning, and told us that the big bang would be preceded by a little bang. The little bang duly went off, and there was a short delay; then …….. The flash illumined the whole hillside. It showed the men standing tense and waiting, the muleteers with a good grip of their mules; and the brown of the path and the green of the trees preternaturally vivid. Then came the bang. The mules plunged and kicked, the hills for miles around rolled the noise of it about their hollows and flung it to their neighbours. Mike Calvert and John Fraser heard it away in their distant bivouacs; and all of us hoped that John Kerr and his little group of abandoned men, whose sacrifice had helped to make it possible, heard it also, and knew that we had accomplished that which we had come so far to do. Four miles farther on we met Alec MacDonald's guides; and just as we were going into bivouac we heard another great explosion, and knew that Jim Harman had blown the gorge. Seen below is the missing in action statement in relation to the men lost or wounded at Kyaik-in village. John Stanley Fuller and John Henry Cobb were not involved at Kyaik-in, but were sadly killed about three weeks later at Hintha. 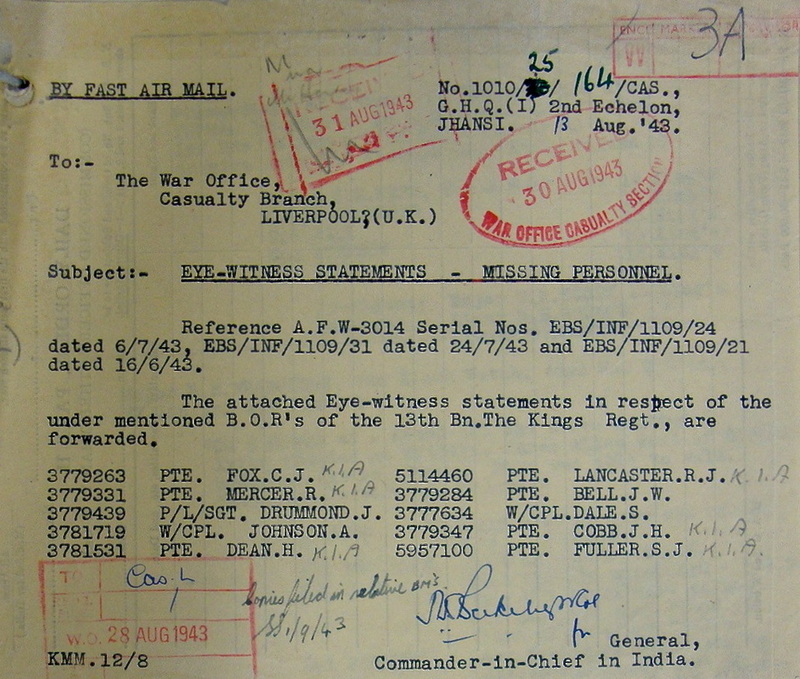 Missing in action statement showing the men lost or wounded at Kyaik-in. 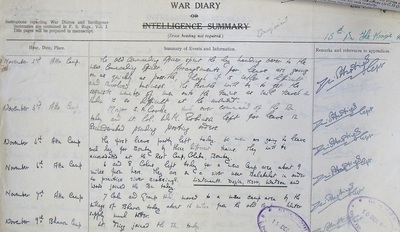 John Kerr's diary for the days and weeks after the incident at Kyaik-in were written retrospectively on pieces of scrap paper. He began to write the diary once he had reached Rangoon Central Jail and towards the end of his time in solitary confinement in Block 5 of the prison. Not surprisingly some of the dates are slightly out, starting with the date of the incident at Kyaik-in village, which John states as being the 4th, but was in fact the 6th March. The pages are made up of short sentences, written in the first person singular or plural, I have not transcribed the whole diary, but have chosen to extract entries that describe John's feelings and which help build a picture of what is happening to him at the time. I have on occasions changed or added words in order to better explain the context and meaning. Diary transcription from March 4th until March 31st: Begins after the battle at Kyaik-in. March 4th. Fight lasted between 11.15-13.00 hours. Shot whilst moving forward on the left side of the bayonet charge. Fox, Dean, Mercer, Jordan?, Lancaster killed. Left by a fence near the village with Cpl. Dale and Pte. Bell. Patched up my wounds with a field dressing and took two tablets of morphine, but had little effect. Sgt. Drummond and Cpl. Johnson left were fallen, too bad to move. Promise to return or send Burmese. Too weak to reach them before captured. Used two rifles as crutches and found straw screens to rest on and under. NB. 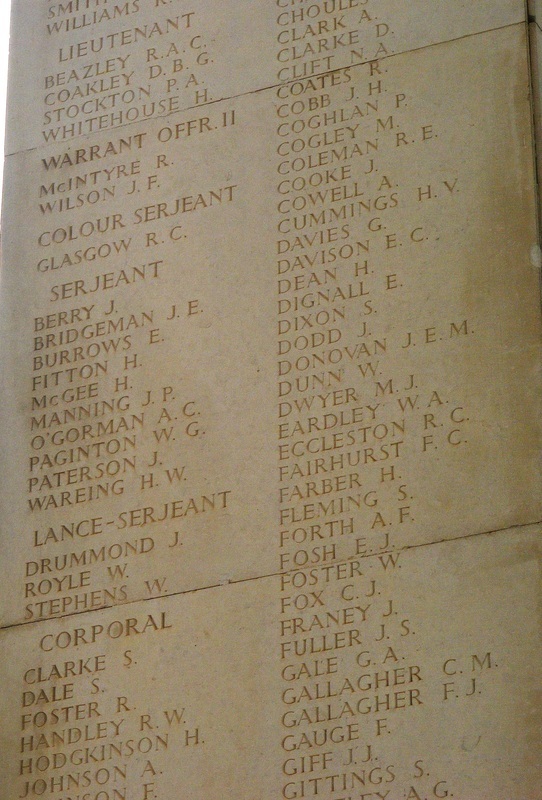 Lance Corporal William Robert Jordan was not killed at Kyaik-in and went on with Column 5 up until the engagement with the Japanese at Hintha. To read more about Bob Jordan, please enter his name in the search box at the top right hand corner of the page. March 5th: Told Cpl. Dale to move away into the nearby jungle in case Japs arrived before I could move Bell. Burmese arrived and searched us, when we resisted they took our rifles and threatened to shoot us. They moved away, I shouted to Dale, heard him call my name then a shot. Fell asleep, woken by old Burmese man, brings rice and salt wrapped in a leaf. Sprinkle some potassium permanganate on bandage, too fearful to remove it to look at wound. March 6th: Opened bandage, wound full of three-quarter inch white maggots. Burmese return with English speaking youth; they promise to help feed and hide us. Moved us on make-shift litters into the jungle, gave us two packets of rice in leaves and water. Lost my medical kit when moved. Bell is becoming restless. March 7th: Before dawn set out to village on my hands and knees about 120 yards each way. Medical kit was gone. Visited by the old Burman during the day. Leg painful (bones shattered), worms increasing in numbers, hole enlarging. Filthy smell of putrefying flesh. Pulled off boot to find a further wound below right ankle. Bell discovers worms in one of his wounds, neither of us can change our filthy and wet bandages. No more food is forthcoming. Flies becoming troublesome; Bell, who was a butcher in peace-time tells me that they are the cause of the worms in our wounds. March 8th: Fetched water from the village well. Journey exhausting and my knees are raw. Bell drinks a lot and misses his cigarettes which were taken by the Burmese. Food is nearly finished, Burmans unfaithful to us, wounds are rapidly deteriorating. We need to somehow move to a more helpful village. Only money left is Dad's lucky sovereign and about 30 silver rupees. Decided to wait a day or two. March 9th: Found Cpl. Dale stiff and cold, lying on his back. Took the bananas and rations and his spare bootlaces. Burmans sneaking around us. Leg is painful and in spasm which makes sleep difficult. Bell finally moved from lying in one position. 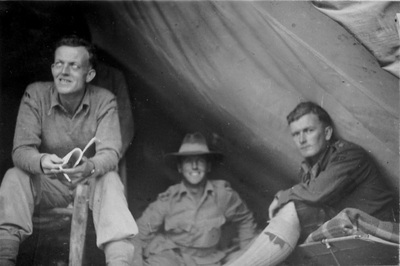 Mid-afternoon: Half a dozen Japs arrive followed by the Burmans who had promised to help us. The officer was friendly and gave us cigarettes and water, then began to question me. I ask about Sgt. Drummond and Cpl. Johnson, but he says they are dead. A medical orderly attended to our wounds. Bell's wound was dressed with sticking plaster. Given some rice to eat. Saw the Japs go off with spades, presumably to bury the dead. We were moved on stretchers carried by Burmese coolies. Taken to a village two miles away and spent night under a house. Asked the Japs for blankets to help us keep warm. Both Bell and myself depressed. March 10th: Wounds dressed again by orderly, he removes the worms with tweezers, very painful. My leg and ankle feel quite dead and numb. Taken to the Nankan rail station where their was evidence of recent shooting. Camped nearby and given a meal of rice and glorious grilled steak. Orderly dressed my wound again, very few worms to be seen, although the orderly was losing patience when I reacted to the pain. After dusk some other officers and Japanese soldiers surround Bell and I with drawn swords and fixed bayonets. It was frightening, but only meant to tease us. The officer in charge interrogated me once again, but only asked about my family, education and so on. Later we were moved to a house where an interpreter was used to ask us questions of a more military nature. I was struck several times in the face and body. Bell was left alone. The interrogation continued until about 3am. NB. The town of Nankan is where Major Calvert and Column 3 took their turn to demolish the railway. 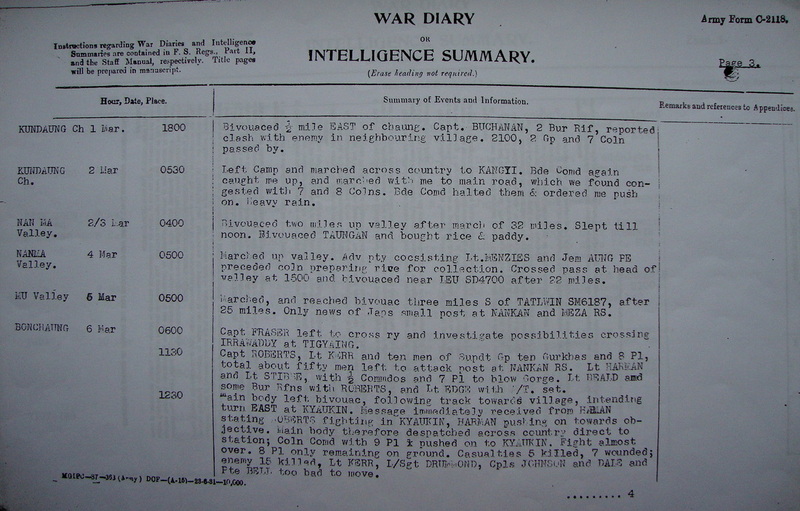 There was a ferocious battle between the Japanese and Calvert's Gurkhas near the rail station, the aftermath of which could well have been what John Kerr witnessed on the 10th March. Seen below is a witness statement given by John Kerr. 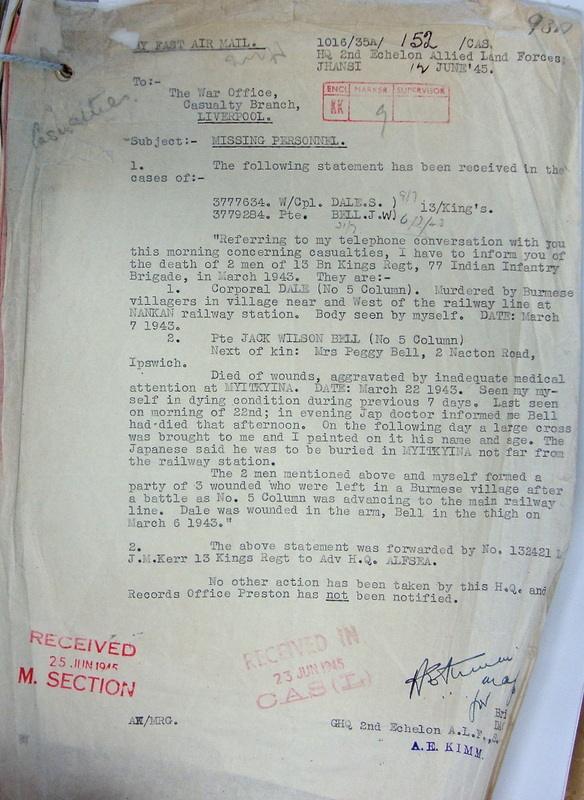 It was sent of the 25th June 1945, after he had been liberated from Rangoon Jail and details the deaths of Corporal Samuel Dale and Pte. John Wilson Bell. Witness statement by Lieut. Kerr in respect of Cpl. Dale and Pte. Bell. March 11th: We were carried along the metals (railway track) for about 3 miles to a blown bridge, later we were loaded on to a train and taken to Wuntho, arriving around mid-night. March 12th: Interrogated by new officer. My wound was dressed in hospital, then the area was dive-bombed by an Allied plane. Put on a lorry and driven southwards. March 13th: Uncomfortable journey on very bad road. Bell was in a separate lorry. Fed only with rice. March 14th: Reached the Naba rail junction, transferred to a cattle wagon. March 15th: Arrived at Myitkhina at dawn. Taken by lorry to the hospital where I was washed and given a clean set of clothes. Bell was not treated as well, he was given new blankets, but not clothes. Moved to a lean-to building alongside the guard-room. Interrogated again that night. March 16th: In a room 8' x 6' on stretchers raised 6' from floor. Regular meals and sympathetic treatment on the whole. Air-raids almost daily, but we were never moved clear. March 17th: Bell not so good. In the jungle we made a pact to give all details to next-of-kin (Mrs. Peggy Bell, 2 Nacton Road, Ipswich). Given condensed milk and 'Marie' biscuits. This is very welcome as Jap food lacks fats and proteins. My leg is still painful inside, but quite numb on the outside. I think my achilles tendon is shattered. The Jap doctors have never tried to ascertain the extent of any fracture, they have just dressed the wound. I have been brought some English books to read. Bell is eating very little. March 18th: Getting bed-sores on my hip and rump. March 19th: I have been given a mosquito net. Bell is worse and has been taken to the main hospital. March 20th: Taken to the main building where some Press men gathered to take photographs of me. Asked to see Bell. He looked terrible; filthy dirty except for his wounds, the Jap orderlies just ignore him. I asked the doctor if he could be washed, which they did do. At about 1800 hours the doctor came to see me and told me that Bell had died at about 15.20 hours that afternoon. I was brought some more books which cheered my mood. These included: 'The Seven Seas', by Kipling and 'The Story of Philosophy' by William Durant. NB. Pte. Bell actually died on the 22nd March, this error is in keeping with the diary for March in being two days in arrears. The mention of the Press photographs is significant. The interview and photography session were used by the Japanese later on as part of a propaganda stunt, with John's name being broadcast on Tokyo Radio. (See image in next gallery). March 22nd: A Jap soldier brought me a large cross and told me to paint an inscription for Bell. I wrote: RIP Pte. John Wilson Bell. Aged 30, the King's Regiment. Died Mon. 20th May 1943. March 23rd: My wound has not been dressed of two days, the worms are back again. March 25th: Rats and mice run all over my room at night looking for bits of food. Jap doctor asked if I like oatmeal and brought some porridge. It was foul at first until they used some condensed milk instead of water. I was also given some soap, a toothbrush and a flannel. March 26th: Doctor gave orders for my 8 week old beard to be clipped. Crutches were brought to me to see if I could stand. Felt very dizzy at first. Told to practice, but cannot put any weight on my right leg. Interrogated again today. 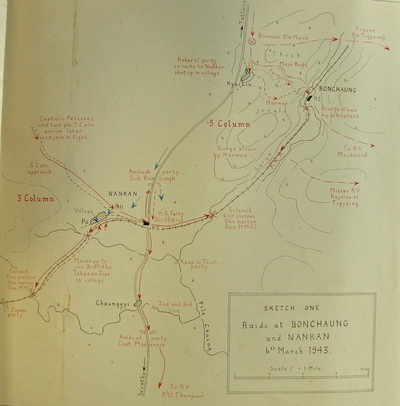 March 29th: I was told today that I would be transferred to Rangoon as soon as the railway was open again. March 31st: Leave for Rangoon this evening. The doctor let me take all the English books. Met up with three British soldiers: Cpl. JW. Leese from Column 8 and Ptes. Hose and Ashcroft from Column 7. 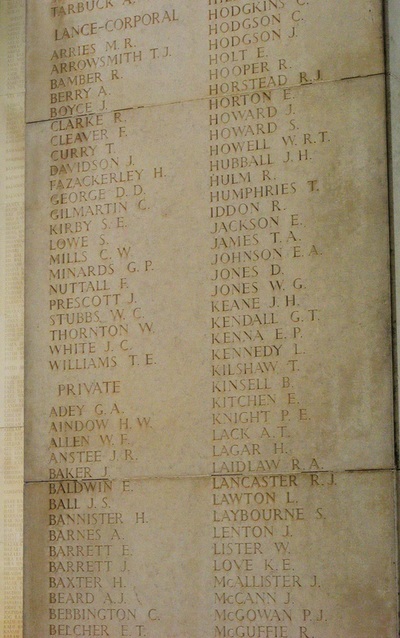 There were also three Gurkhas, one whom was with Column 1. NB. It is to be presumed that the above mentioned soldiers had also been held at Myitkhina after their initial capture in 1943 and that Lieut. Kerr did not know of their presence at the holding camp until the 31st March. I have chosen to leave the diary at this point, as it is a natural break in proceedings, having dealt with the action at Kyaik-in and the fate of all the men who perished as a consequence of the action there. 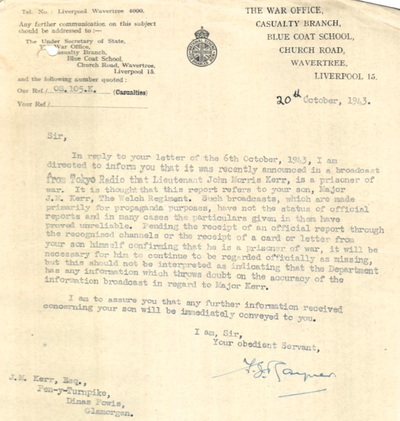 Seen below are some more images in relation this story, including the letter sent to John's father informing him of the propaganda broadcast in October 1943. Also shown are more details about Sgt. 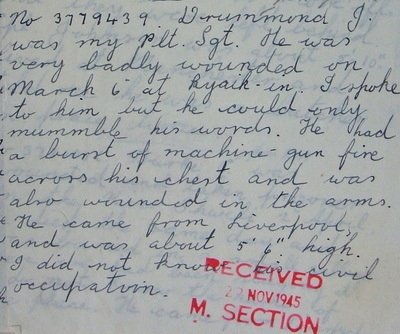 Drummond and Corporal Johnson in the form of a letter, which I believe was written by Pte. James Zorn of the 13th King's and Pte. Bell's inscription upon the Rangoon Memorial at Taukkyan War Cemetery. Please click on any image to bring it forward on the page. 3779263 Pte. Charles James Fox. An original member of the 13th King's that travelled to India aboard the troopship 'Oronsay' on the 8th December 1941. Charles is recorded by the CWGC as having perished on the 1st March 1943, this is also the date given for his death on the official listings for 5 Column casualties. 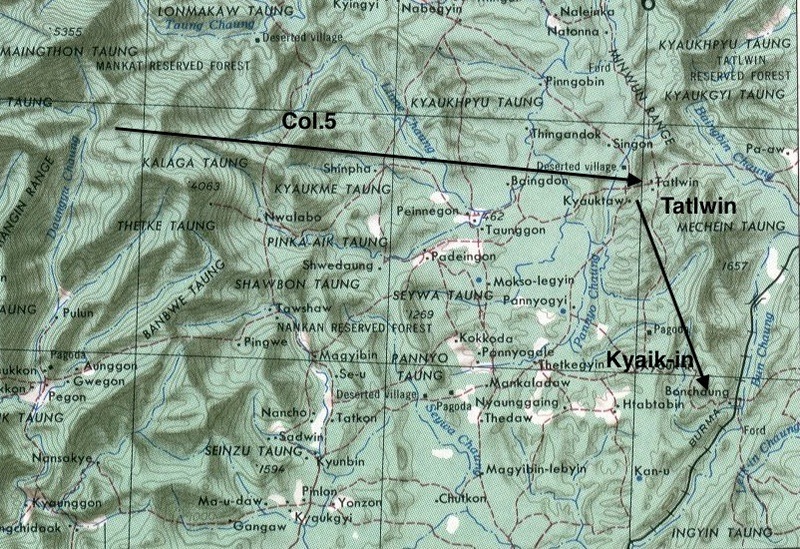 The column were travelling close to a village named Kundaung on the 1st March and there was an engagement with the Japanese around this time. 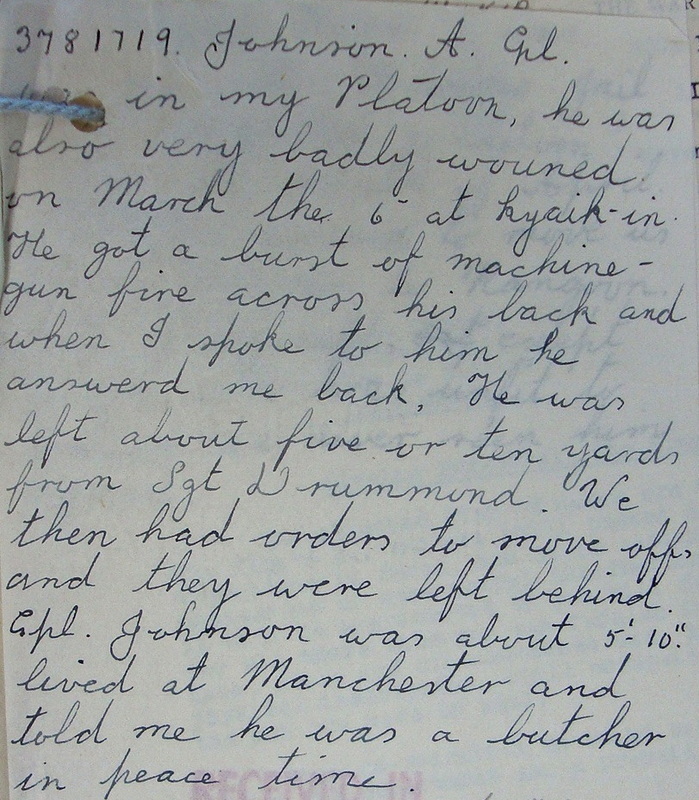 However, Lt. Kerr's diary seems to contradict both these sources, placing Pte. Fox at Kyaik-in on the 4-6th March. 3779331 Pte. Ralph Mercer. Another original member of the 13th King's that travelled to India aboard the troopship 'Oronsay' on the 8th December 1941. 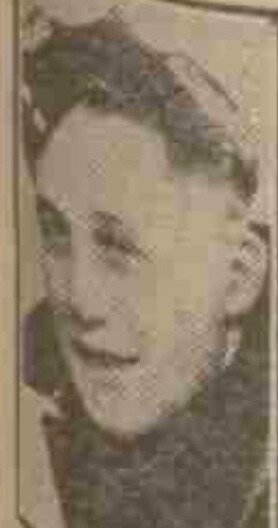 Ralph was killed in action at Kyaik-in on the 6th March 1943. 3779439 Sgt. James Drummond. Another original member of the 13th King's that travelled to India aboard the troopship 'Oronsay' on the 8th December 1941. Served with Lieutenant Stibbe's Rifle Platoon during the early months of training, before being promoted to Sergeant and taking up his place in Platoon 8. James died from his wounds incurred at Kyaik-in village. 3781719 Cpl. Alfred Johnson. Yet another original member of the 13th King's that travelled to India aboard the troopship 'Oronsay' on the 8th December 1941. Alfred was killed in action at Kyaik-in. Please see the last section of this story for more details about his time in India and Burma. 3781531 Pte. Henry Dean. Another original member of the 13th King's that travelled to India aboard the troopship 'Oronsay' on the 8th December 1941. Henry was killed in action at Kyaik-in. 5114460 Pte. Reginald John Lancaster. Originally enlisted into the Royal Warwickshire Regiment, transferring to the 13th King's on the 26th September 1942 at Saugor. According to Bernard Fergusson, Reginald was an excellent swimming instructor during Chindit training. Died of wounds at Kyaik-in. 3779284 Pte. John Wilson Bell. An original member of the 13th King's that travelled to India aboard the troopship 'Oronsay' on the 8th December 1941. Pte. Bell died from wounds sustained at Kyaik-in on the 22nd March 1943, whilst a prisoner of war at Myitkhina. He was buried close to the rail station situated in the city centre. John was married to Peggy Bell and lived in Ipswich in Suffolk. 3777634 Cpl. Samuel Dale. Another original member of the 13th King's that travelled to India aboard the troopship 'Oronsay' on the 8th December 1941. Samuel was reportedly murdered by some Burmese on the 7th March 1943, after being left wounded and unable to move in the jungle near Kyaik-in. Seen below are some more photographs featuring Face 5 of the Rangoon Memorial. The memorial forms the centre piece of Taukkyan War Cemetery, situated on northern outskirts of Rangoon. Upon the Rangoon Memorial are close to 27,000 names, these represent the casualties from the Burma Campaign who have no known grave. Please click on any image to bring it forward on the page. 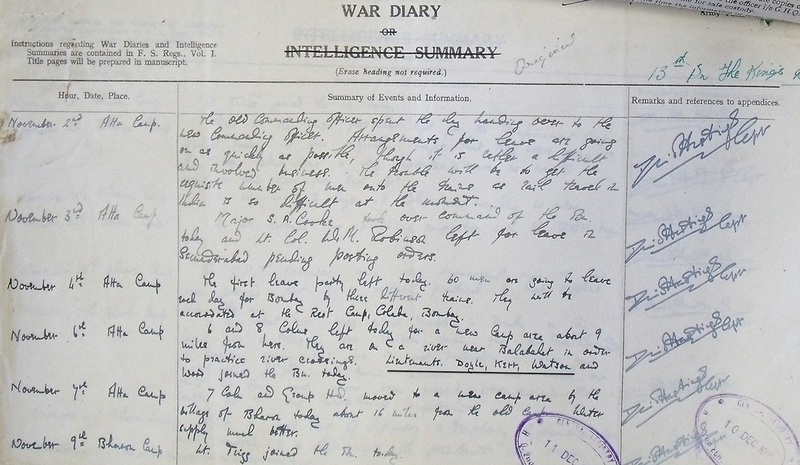 After Bernard Fergusson had returned from Burma, a formal Court of Enquiry was held at Imphal on the 16th June, looking in to the events of March 6th and the men lost to his column on that day. 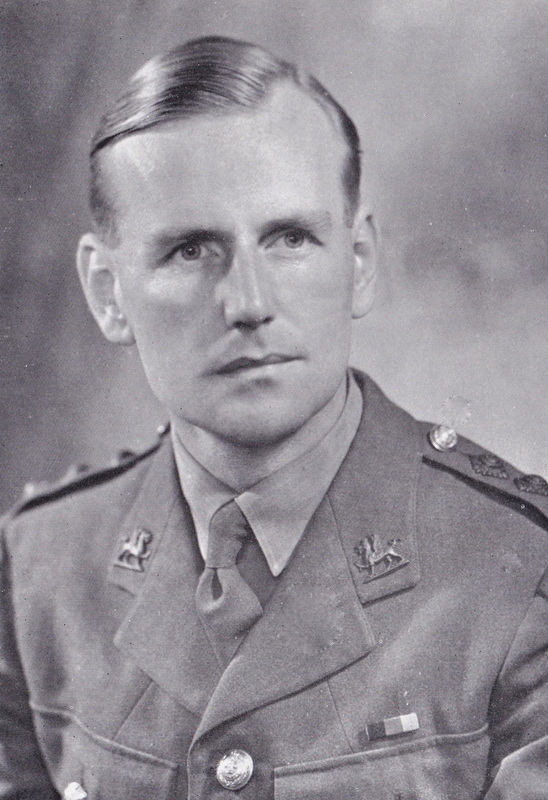 The Officers presiding at Imphal were taken from Chindit Column 8 and included Major Scott as Chairman. It is to be presumed that similar hearings took place in relation to other units of the 77th Indian Infantry Brigade and that these were simply agreed practice on debrief from the operation. 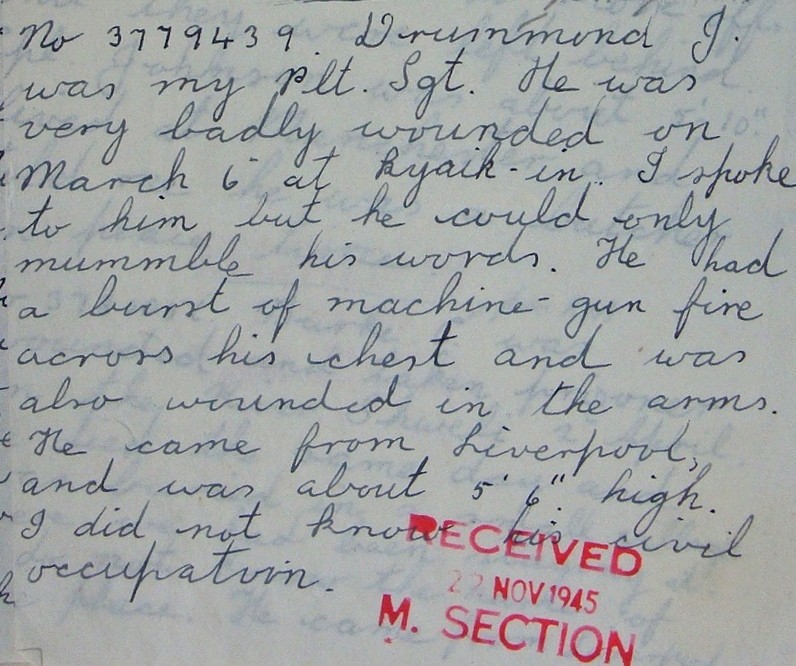 The loss of Lieutenant John Kerr and his platoon section at Kyaik-in, was the Brigade's first instance of having to leave an officer and casualties with a village Headman in 1943. Certainly, there were other examples of this procedure later on during the operation, Lieutenant Ian MacHorton of Column 2 being one such example. The findings of the enquiry were drafted on to a one page report (see below). This identified the casualties and even named the village Headman involved, namely, U Po Toke of Htantabin. It would be interesting to know whether U Po Toke was questioned after the war was over and asked why he had given up the British casualties so quickly to the Japanese in March 1943. 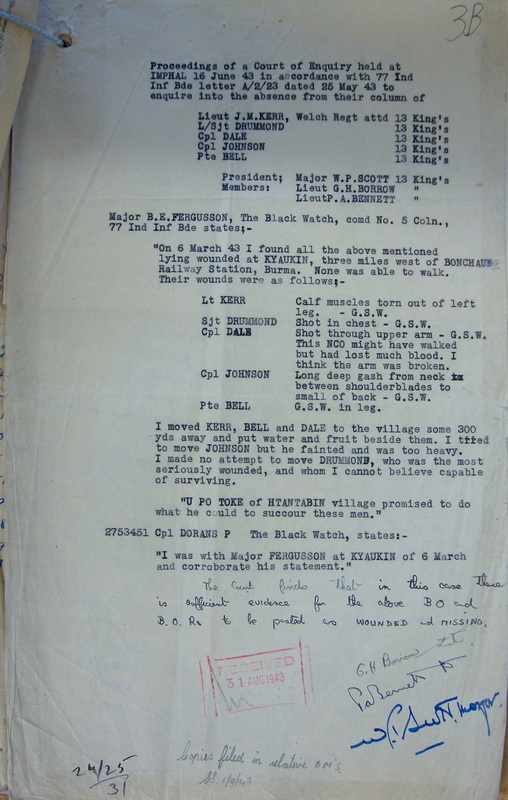 The conclusion of the enquiry was that everything that could of been done for the casualties at Kyaik-in was indeed done and that the men not known to have perished on the 6th March, would be placed on to the missing in action listing for Column 5. 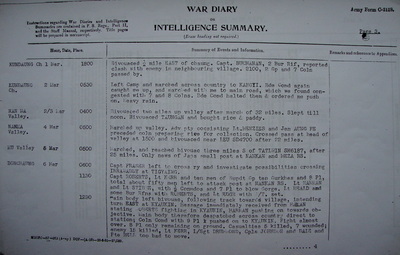 Seen below is the one-page report investigating the happenings of March 6th 1943. Please click on the image to bring it forward on the page. Court of Enquiry Report, Imphal, June 16th 1943. 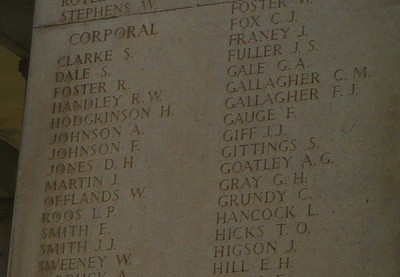 In March 2012 I received an email contact from Gill Simmonds, granddaughter of Corporal Alfred Johnson. Gill gave me some valuable information about her grandfather and how her family came to terms with their sad loss in 1943. 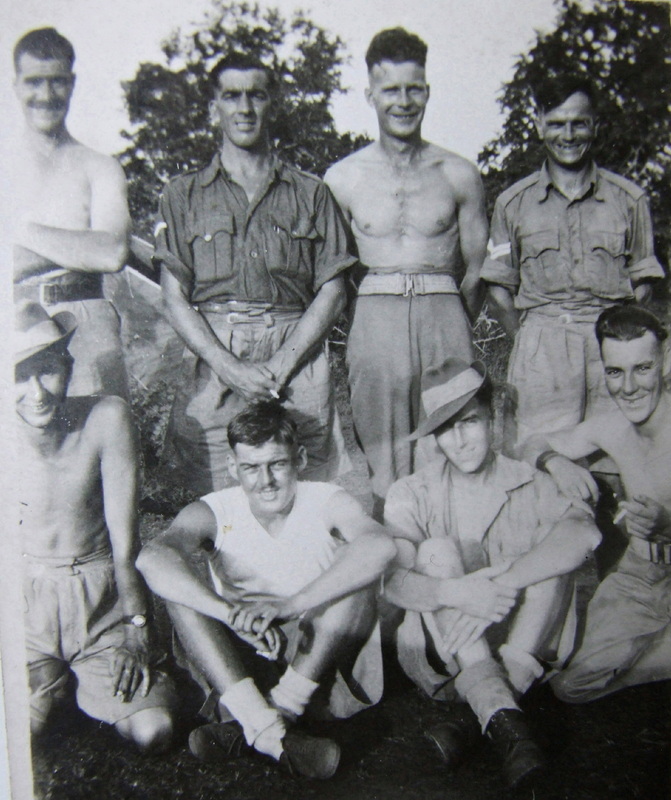 She sent me some photographs of Alf with several of his Chindit comrades from their time at the training camp in Saugor. These images confirmed the link to Lance Corporal William Jordan (mentioned at the very beginning of Lieut. Kerr's diary) and his possible presence at Kyaik-in on the 6th March and therefore his possible membership of Rifle Platoon 8. I just wanted to thank you for putting together this excellent website. 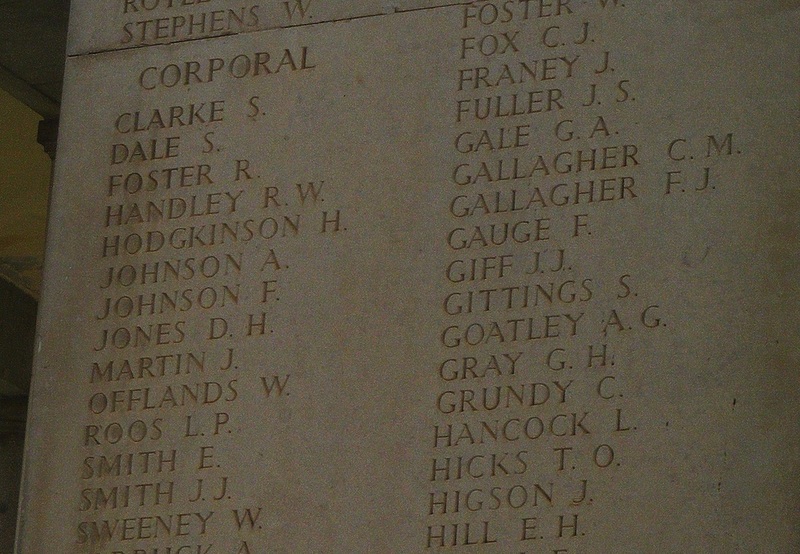 My grandfather was Corporal Alfred Johnson of the 5th Column, he was killed on 6th March 1943, although we have never been quite sure where. Every so often I look around on the internet hoping to find a bit more information about him and his fellow Chindits, but until now couldn't find a great deal about the ordinary soldiers, so am so pleased to have found this. However, it does bring up a whole host of odd emotions. My Gran did talk about him a great deal as she wanted my Mum, who was only four when her father was killed, to know as much about him as she could. I had a very quick word with Mum this afternoon, she mentioned Alf undertook driver training at Saugor. We know he also looked after a number of mules as he had experience of handling animals from his time as a butcher. Your summary of what happened on the 6th March does confirm what we can remember. Pte. Jimmy Zorn visited my Gran after he was liberated from being a prisoner of war in 1945. He told her what he could remember of that day, and said someone had definitely gone back to the village, only to find Alf dead. So, we knew he had not suffered for long. 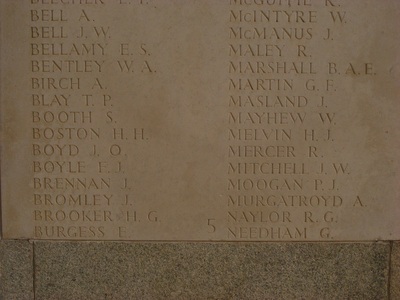 My Gran was never quite sure who went back, or why, but having looked at the tale of Tommy Roberts' platoon on your website and the note about Corporal William McGee going back to Htantabin village with the Riflemen on the 6th March, it seems possible that it may have been him. I know they found Htantabin had fallen into Japanese hands, but as Alf and Sgt. Drummond were left outside the village it is not impossible that they were able to find their bodies. I am glad that Major Fergusson at least attempted to ensure all the wounded were cared for. We also have some recollection of Gran being told he'd given someone his canteen, saying he would not be needing it any more, but we are not sure who told her this. Mum says she often wondered for certain what had happened to the man who was left with Alf, this must have been Sgt. Drummond. She also mentioned that the wounded who were left in the village heard the explosion from the bridge at Bonchaung, so they knew that the column had got through. I can only imagine this report filtered through in conversations at Rangoon prison as the inmates pieced together their own timelines from the operation. My Mum told me that it was only later on in life that she realised just how difficult it must have been for my Gran to carry on, especially given the length of time it took for official information to come to her, but like your Gran, she somehow just picked herself up and kept going. I can understand what you mean about keeping your Nan's memory alive; part of the reason that I (and one of my brothers) have been trying to find more details over the years, is down to how we felt about Gran. Mum also has copies of letters to my Gran from George Borrow, who as you will know was killed with Wingate in 1944, and also from John Kerr. We don't know what happened to the originals, but it is possible she gave them to Alf's family, or sent them on to a couple of other families who are mentioned. 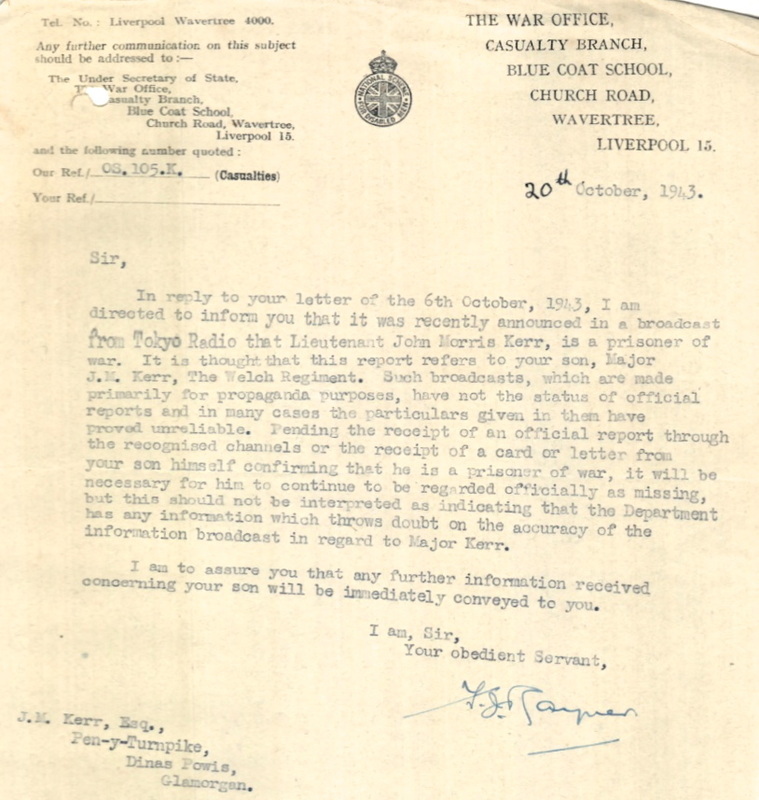 Corporal Samuel Dale married my Aunty Dorothy just three weeks before they left for India, so it is possible his family have the original letters. I've attached a few snaps, which I hope will be of interest, including a copy of the one which Bob Jordan's relatives gave to you for your website. It feels very odd to know that another family somewhere had the same photo! The photo of them brewing up is with Bob Jordan and "Potto" or Lance Corporal Patterson. I am truly grateful to Gill for sending me so much invaluable information about Alfred Johnson. I feel a great connection with her family's story, as it reflects in so many ways, that of my own. Seen below are two of the photographs Gill Simmonds sent over to me. 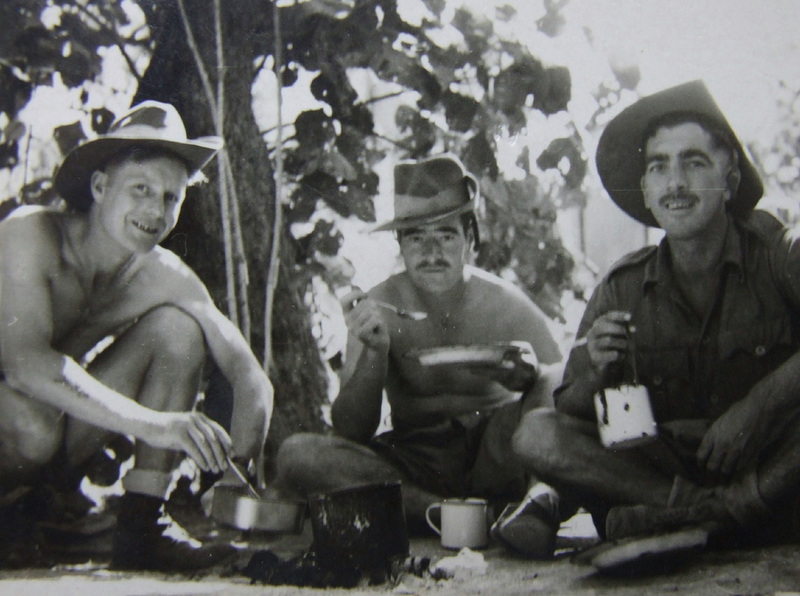 The first is the one mentioned above, showing 'Patto' Patterson (right), Bob Jordan (centre) and Alf Johnson brewing up at the Chindit training camp at Saugor in 1942. 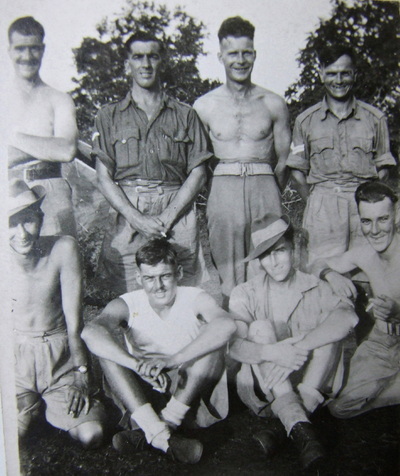 The other shows a larger group of men, with Alf standing, second from the right, with 'Patto' and Bob Jordan next to him on the left as we look. I wonder who the other five men are; could they be any of the other soldiers lost at Kyaik-in? I would to thank both Miranda Skinner and Gill Simmonds for their fantastic help in bringing these stories to my website pages. Mr. and Mrs. Alfred H. Johnson of 38 Mansfield Road, Flixton and formerly of Springwood Avenue in Allerton, have been notified that their elder son, Corporal Alfred Johnson, has been posted as missing in the Indian theatre of war. They would be grateful for any further news. Official notification has been received by Mr. and Mrs. C. Lancaster of 21 Rowley's Green Lane, Longford in Coventry, that their son, Pte. Reginald John Lancaster, aged 24 of the King's Regiment, has been killed in action. Pte. Lancaster, who was formerly employed by the Lockhurst Lane Co-operative Society, served in France with the Royal Warwickshire Regiment and took part in the evacuation of Dunkirk. He was then transferred to the King's Regiment and saw further service in India. It is likely that Reginald served with the 8th Battalion of the Royal Warwickshire Regiment in France during the summer of 1940. The battalion came up against the German Army in the region south of the Escaut Canal, near the town of Calonne and fought a prolonged battle with the enemy over the 20th, 21st and 22nd May that year. I am trying to discover as much information about my Great Uncle, who I discovered from your website was a member of 5 Column and died on the 6th March 1943 at Kyaik-in. He was rarely mentioned in the family and I only found out about him after I began to trace my family tree. 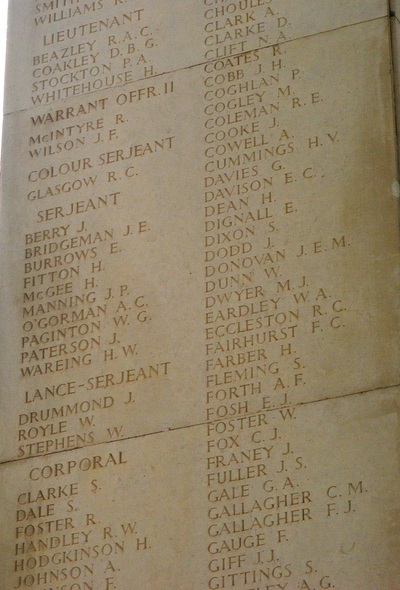 He is remembered on the Roll of Honour at All Saints Church, Sutton, St. Helens. According to the 1939 Register, he was living at Victoria Terrace in Rainhill and was listed as a milker/heavy farm hand at that time. Ralph was married at the time of his death in 1943, but I am unaware if he had any children. As Liverpool is twelve miles away from St. Helens, I was surprised to find he had joined this Regiment rather than one of the other Lancashire or Cheshire Regiments closer to hand. Thank you once again and if I find anything further about Ralph I will let you know. Roll of Honour boards at All Saints Church, Sutton near St. Helens. Ralph Mercer is remembered on the board to our left. Copyright © Steve Fogden, January 2015.